Tame Mosquitoes Inside and Outside of Your Home - Columbia Builders, Inc.
Mosquitoes can be a big problem during the hot, humid days of summer – keep them away from your home with these tips! The full heat and humidity of summer is upon us, and with it comes mosquito season. These pests are currently buzzing around the Mid-Atlantic, and with disease from their bites on the rise in the past few years, you’ll want to take some precautionary measures to keep them away from both you and your home, indoors and outdoors. Take a few minutes to assess your home and yard, and make it a less hospitable place for these insects to flourish. The best way to protect your entire home against mosquitoes is to start outside. Mosquitoes thrive in wet areas, and they require standing water in order to breed and multiply. If you have water features in your landscape, you’ll want to outfit them with a pump or recirculation system to keep the water moving. And keep an eye out for any potential areas that could hold standing water – flower pots, toys, kiddie pools, even grill covers – that could easily become a home for mosquitoes if not dealt with promptly. In addition, keep the plants in your landscape trimmed and tidy – Zika-bearing mosquitoes that bite during the day use overgrown vegetation as shelter from sunlight. Whether at work or play, when you find yourself enjoying a day outside, consider using insect repellant or wear long-sleeve clothing and long pants to cover exposed skin. This is especially important at dawn and dusk when the insects are most active, and even more imperative if you’re in an area close to a body of water. To keep mosquitoes from infiltrating your home, make sure your home is adequately sealed. Inspect all window screens and patch any holes that you find. Be sure that your screen doors close securely as well. Another great way to protect your family from mosquito bites? 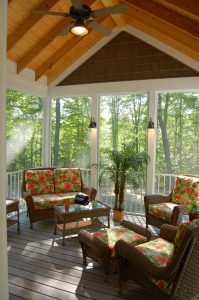 Install a fan in your outdoor living area. These insects are not strong flyers, and the addition of a fan in or around your deck or patio, provides an easy way to keep them away. This entry was posted on Friday, July 27th, 2018 at 8:27 am. Both comments and pings are currently closed.